Find some of our best slow cooker casserole recipes all in one handy collection with our 17 Slow Cooker Casserole Recipe Classics free eCookbook. In this free eCookbook, you'll find lots of tasty and easy-to-prepare slow cooker casseroles. Included in this eCookbook are slow cooker chicken casseroles, slow cooker beef casseroles and more. Our free eCookbook is filled with easy slow cooker recipes for casseroles. These great slow cooker recipes are handy for weeknight meals. Whether you're craving an Italian-, Mexican- or even Chinese-style dinner, these slow cooker casseroles span all of those culinary genres and more! Inside this free eCookbook, you'll also find excellent slow cooker recipes for comfort food classics, such as stuffed cabbage rolls, cheesy chicken tater tot casserole, chicken and dumplings and others. AllFreeSlowCookerRecipes has a wide variety of slow cooker casserole recipes, but we've compiled some in this free eCookbook that we know our readers love best! In this free eCookbook, you'll find traditional Italian classics, as well as recipes that turn Italian dishes on their heads! We have included both meat-filled and meatless lasagna recipes, as well as a slow cooker pizza casserole recipe...and even a Mexican pasta recipe--that's really more like a slow cooker Mexican casserole! Be sure to also check out some wholesome classics, such as our recipe for Amish Style Chicken and Noodles, as well as simple, yet unique recipes, like our recipe for Elegant and Easy Chicken Cordon Bleu. Whether you're entertaining, making a dish for a potluck, or serving up a regular family meal, these slow cooker casserole recipes will satisfy every occasion all year round. Slow cooker casseroles save you the trouble of making an elaborate, multi-course meal. Your whole dinner is wrapped into one dish! Casseroles are the ultimate, easy one-pot meals. Read on to learn what easy slow cooker recipes you can expect from this slow cooker casserole eCookbook and make sure to download your free copy today! That way, you can take these printable recipes for a slow cooker wherever you go and share them with friends. Bonus Recipe - This slow cooker pizza casserole recipe for Slow Cooker Pizza Pasta (shown above) is a bonus recipe found in the back of our free eCookbook. 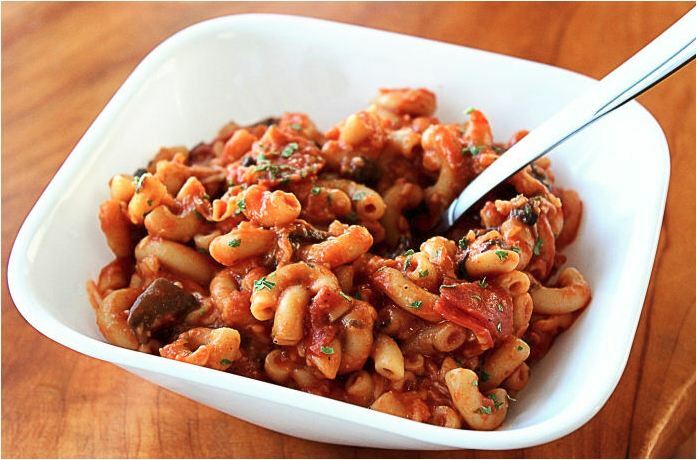 It's made with all the ingredients of your favorite pizza--except it has macaroni noodles! This kid-friendly dish will wow adults too. It's a simple slow cooker pasta recipe for a weeknight meal. Pepperoni and two types of cheese give this outstanding dish an extra, savory punch. Our chapter on slow cooker beef casseroles is packed with awesome beef dishes--including ground beef casserole recipes. Also in our beef chapter, you'll find excellent slow cooker recipes for lasagna, macaroni and beef, a slow cooker pizza casserole recipe and more. Not to mention, we've also included unique takes on classic recipes with our recipe for Beef Chow Mein Casserole, slow cooker stuffed cabbage rolls, a slow cooker Mexican casserole recipe for Mexican Pasta, and others. Download our free eCookbook, and be sure to check out our expansive slow cooker beef casseroles chapter! Cowboy Casserole for Slow Cooker (shown above) - This cowboy casserole recipe is a continued favorite on AllFreeSlowCookerRecipes, made with ground beef, potatoes, beans, tomato soup and more. This slow cooker beef recipe is "meat and potatoes" at its best. Download your free copy of the 17 Slow Cooker Casserole Recipe Classics eCookbook today! Slow cooker chicken casseroles are the perfect, go-to meal idea for any night of the week. These slow cooker casseroles are budget-friendly, tasty and oh so easy to make! Our chapter on slow cooker chicken casseroles is so jam-packed with simple slow cooker recipes; you won't know which one to make first! You'll love them all. Our slow cooker chicken casseroles chapter has additional tasty slow cooker casserole recipes options, such as Thrifty Chicken Stroganoff, Amish Style Chicken and Noodles, slow cooker Chicken & Herb Dumplings and more. Our free eCookbook, 17 Slow Cooker Casserole Recipe Classics, is filled with wholesome and easy recipes for a slow cooker. Cheesy Chicken Tater Tot Casserole (shown above) - This slow cooker chicken casserole recipe couldn't be easier, made with frozen tater tots, bacon, chicken, Cheddar, milk and seasoning. Our meatless slow cooker casseroles might lack beef or chicken, but they don't skimp on taste. Whether you want to have a meatless Monday or make a slow cooker meal on the cheap, these recipes are perfect! You'll love this recipe in our free eCookbook, 17 Slow Cooker Casserole Recipe Classics, as well as others! Be sure to try our recipe for Slow Cooker Mushroom Stroganoff, or our recipe for Slow Cooker Vegetarian Lasagna. This lasagna is so tasty, you won't miss heavy ground beef. By downloading our free eCookbook, you'll find these easy slow cooker recipes and many, many more! So, go casserole crazy with our fun and easy slow cooker casserole recipes found in our free eCookbook, 17 Slow Cooker Casserole Recipe Classics. Slow Cooker Eggplant Parmesan (shown above). This restaurant-quality dish is super simple to prepare for your slow cooker. It cooks 5 hours, so you can prep it and leave. Try your hand at an Italian-style classic with this easy recipe. Weekly emails with slow cooker recipes, tips, collection pages and more. Chances to win cooking books and products from our weekly giveaways and contests. New FREE recipes made available to you throughout the year. Access to our free recipe library full of hundreds more free recipes. The opportunity to share ideas and help others in the cooking community. You've had a great preview of what this new eCookbook has in store for you. 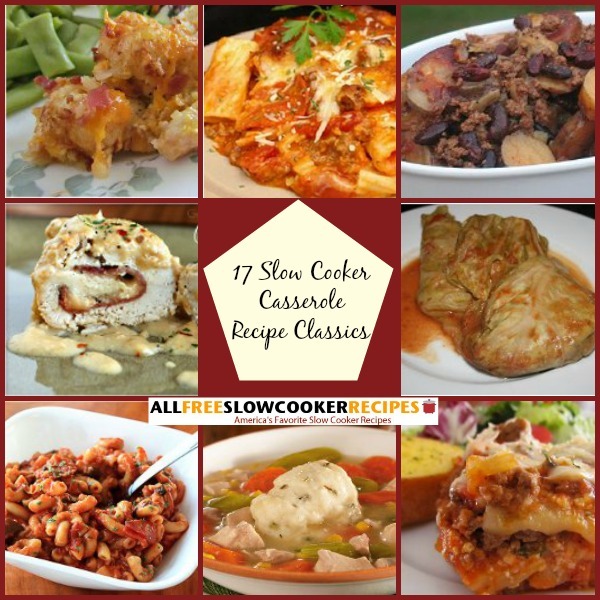 If any or all of these recipes appeal to you, click on one of the eCookbook icons anywhere on this page to download your free copy of 17 Slow Cooker Casserole Recipe Classics. Once you get your copy, you can either keep it on your computer or eReader or print it out and keep it in your kitchen. No matter how you use your eCookbook, once you've tried even one of the recipes, you'll be glad you downloaded it. For help downloading this eCookbook, check our guide on how to download eCookbooks. If you like the slow cooker dumpling recipe in our free eCookbook, check out our collection of 11 Wonderful Recipes For Dumplings. Can we get theses cookbooks by mail in book form? Not everyone has the knowledge to download or print, you ought to think about printing mailing them, I'm sure those that can't download or print would be willing to pay for that service. Not everyone is a millenial. You're on a computer, though, so you must have some kind of knowledge in your pocket. I am not a Millenial. I will be 50 next year. In case you didn't know how easy this is- to download all you have to do is click on the download link. It will appear on the bottom or top of your computer screen as a PDF. You can access and read the pattern right from there. There's nothing to it! Good luck, and I am sure you will get it figured out in no time. Don't be scared! This is my first time seeing this I think I will like it. Never seen this before I like it alot!